Craft your most elegant sword when you build a speedy needle with the DIY LARP Small Sword - Unpainted! Used to create slim thrusting swords, this blank sword hilt template is perfect for DIY LARPers who want to make a custom blade! Made from a durable polyurethane foam cast, this elegant LARP sword hilt is unpainted, allowing you to paint it to your satisfaction. Floral accents decorate the hand guard of this hilt, while the pommel features spiraled ridges. The handle of this hilt displays a blank surface, allowing you to wrap it in whatever you choose. 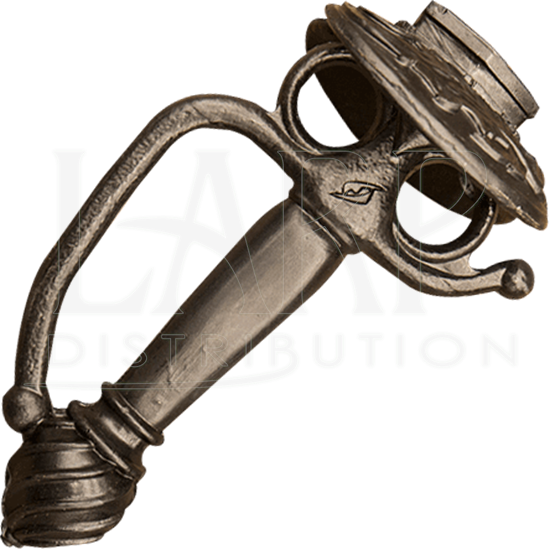 Its durable construction is completely safe to use in LARPing events and has been approved by the top LARPing organizations. It also requires virtually no maintenance and will last longer than regular foam latex handles. LARPers who wish to create their own LARP small sword should seriously consider this building block when planning their next DIY project!